Planes, boats and bicycles--sv & rv Odin: Our longest leg yet & Goodbye, Bahamas! Hey, look! We finally got out the spinnaker! Pretty. Clarence to Mayaguana: We're up early, but we can't leave too early. It's a 24-hour run to Mayaugana and we need to arrive with good light to enter the harbor. A Lagoon catamaran arrives at our dock, so we grab lines & give them the rundown ("came from Mayaguana into the wind & waves but the worst part was entrance to Clarence!"). They return the favor and throw lines for us as we depart. The First Mate secures lines & fenders, then takes the helm to follow our bread crumbs back out. The waves out on the Atlantic are from the NE and white caps are created as they break over the reef, right outside the harbor entrance. It's actually not to difficult to navigate--stay between the white caps off our port and starboard! We work our way around the point by 7:30 am and they wind and waves are now behind us. The Captain goes up on deck (my least fav part) to deploy the spinnaker. It goes up with only minor glitches and we are doing 5-6 kts with 10-12 kts of wind behind us and both engines are off! We're sailing! It's grey ahead of us and I'm still getting used to new flutters & squeaks as The Captain goes down to relax. How to I douse this thing in an emergency? "You don't." I post a picture of the spinnaker on FaceBook and I get a note from our friend Marc, the previous owner--let it out more! Well, that's tons better. Technology is an amazing thing. Cargo ship #1 is off our starboard, heading up Long Island. Open water passages are a lot like flying. Hours and hours of boredom punctuated by a few moments of excitement. We do 3-hour shifts, with the off-shift person trying to spend as much time down below resting, as possible. For the first time, we are comfortable reading (and occasionally cooking!) The Captain even downloaded a few tv shows for his iPad. It doesn't look that big or that close, but it was 650 ft long! We enter Crooked Passage, a shipping channel. 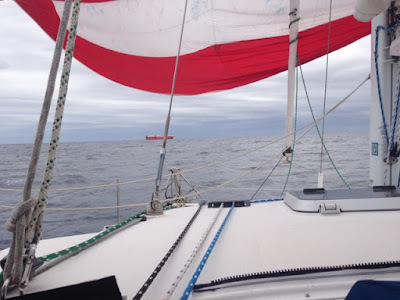 Technically, this should be less stressful during the day, but with the engines off and the spinnaker up, we are limited on our manueverability. I call the cargo ship #2 on the radio and say "Hi. Sailboat here. 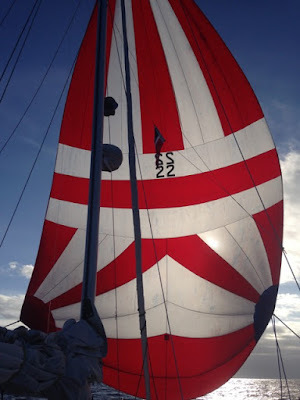 See our pretty spinnaker? We have you in sight. We're attempting to turn behind you, butttttttt..." The 650 ft freighter graciously offers to make a slight turn also, so we don't become his hood ornament. Thank you, Toronto! By 2:00 pm the winds are less than 8 and I suggest unraveling the spinnacker sock that is twisted around the halyard while winds are light. The Captain gets so dang excited that he got it straightened out, that he yanks the spinnaker down. By the time he gets back to the cockpit, the wind is back up to 10. "Huh? I'm not going back up there." The genoa is unfurled instead and we start an engine. "Uh oh. The port engine is vibrating." (We're using the port because the starboard alternator is acting up.) 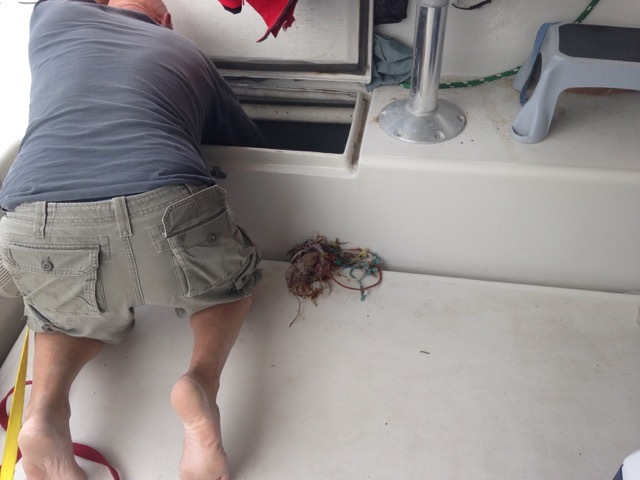 More working on boats in exotic places--The Captain raises the engine out of the water and discovers a piece of "ocean trash" wrapped around the prop. (LOVE OUR RETRACTABLE ENGINES!) As the sun sets, the calm winds try to clock SW! That's not in the forecast. They are supposed to switch more northerly. Motoring on one engine at 5 kts. Cargo ship #3 passes behind us as we pass Crooked Island. I have 2 bars of cellular! Still sailing with 10 kts of wind behind us. 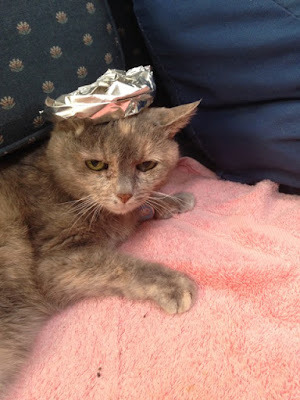 Amelia the Navigator wearing her tin-foil tiara to replace the missing radar reflector. 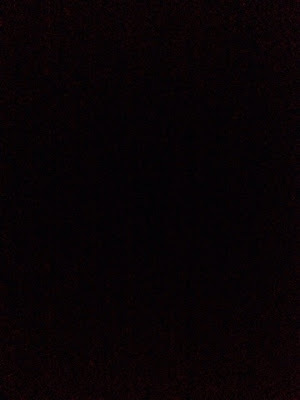 By my 10:00 pm "off-duty", I sleep the whole 3 hours. When I return we've passed the Planas. The Captain saw a white nav light go by, probably sv Strider. according to our AIS. There is no cell service, so I'm now tweeting on our Iridium. We enter the Mayaguana Passage, our second ship channel. As soon as I take the helm and The Captain ducks below, I hear a "clink" (like a penny or washer dropping), then CLUNK (screw or pocket knife). No sign of anything amiss in the cockpit or on deck that I can see. The Captain appears in companionway and says, "What was that? It sounded big and over my head?" (He'd gone up to our berth to lay down). I shine a flashlight up at the rigging. Is the radar reflector gone!? I glance at the chartplotter and see ship #4 (but it's only 190 ft. No big deal). I cross over the genoa and shine a flashlight on it to make us more visible. I'M AWAKE! Better than coffee. The wind starts to clock back around to N @ 4 kts. Mayaguana to Providenciales, Turks and Caicos: I'm up in time to make coffee before our 11:00 pm departure. Splashing behind the boat keeps drawing me into the cockpit. When I shine a flashlight into the water, a fish or a turtle dives back down out of sight. I finally stand there long enough to see tiny teeny, tiny jellyfish(?) floating in the water. That must be what they are after. OK, "raise anchor unobstructed" was an over statement. Before sunset, I took note of which way we were facing and our relationship to the island. After sunset, I can hear the waves crashing on the NE side of the island and try to picture the limestone cliff that was in front of us. 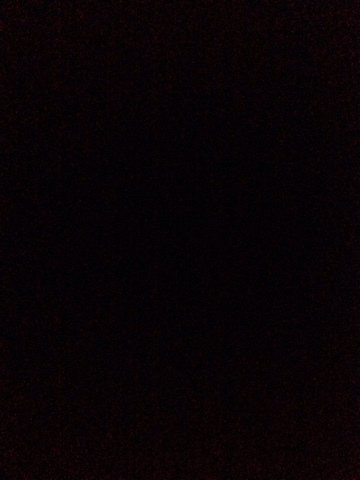 We have a longer-than-usual brief before we pull up anchor in the pitch black (not a single light on shore). I'll use compass heading, Garmin heading and the depth finder (water should be getting deeper instead of shallower) to turn us away from the island. I usually prefer to have two sets of eyes on the chart plotter for trickier navigation like this, but he needs to secure the anchor--with only a head lamp. He turns around and gives me a thumbs up from the bow to tell me the anchor is up and I'm driving--and blinds me with is head lamp! "Sorry." I'm holding a compass heading of west and the water is getting deeper. That was exciting. Who needs coffee after that?! The Captain takes first shift. I was eager to continue on our journey without much rest because the ocean swell had been so comfortable. The waves should still be behind us. However, it's noisier down below than it was before. There are waves slapping the bottom of the bridge deck, but I still doze. When I pop back out, I can see the glow of the Turks on the horizon. We have 10-15 kts of wind and both engines are off. 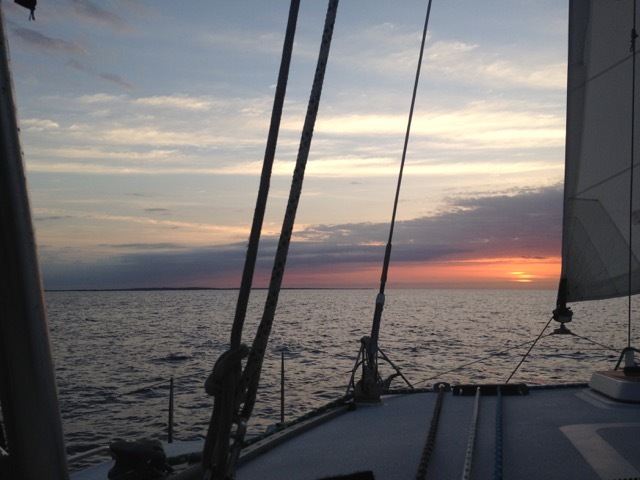 As I take the helm, I see lights off our starboard but nothing on the AIS. Perhaps they are farther away than they look. Boom. There he is, and he will pass right off our bow. I wake The Captain and he elects to furl the genoa and turn 90 degrees starboard. Oddly, this seems to improve our ride. We clear the ship and turn back. As the sun comes up, we can finally see the waves coming at us from quartering to beam with the occasional white cap, which is what is slapping the bridge deck as we crest the wave. "Turn back right so I can sleep." Huh? Turks & Caicos is over there?! I finally wrestle The Captain into the dinghy to clear Customs by 10:30 am. He dinghies to the beach and heads out "on a short walk to customs" per the guidebook. However, the guard at the gate waves him down the road. After walking at least a mile, a local pulls over and offers him a ride. Jose has to make a phone call to find out where The Captain should be and then turns around and drives him back and points him down a "goat path". He clears customs easily but is instructed to come back at 2:15 for immigration. No sleep for you today, honey. Stats: Total time 10:12, avg speed 4.7 kts, total time. Sailed two hours. Motor-sailed.